The two North Miami girls who went missing yesterday after a Shabbos walk gone awry told their rescuers that hearing helicopters circling overhead in the darkness provided them with much needed reassurance and hope during a chilly Florida night spent lost in swamp-filled woods. 16 year olds Bracha Katz and Rivka Moshe, tenth graders at the Lubavitch Educational Center’s Beis Chana High School in Miami, were enjoying a school wide Shabbos retreat at a vacation property in Kissimmee when the pair failed to return after going out to enjoy a walk on Shabbos afternoon. The farther the two walked the more difficult the terrain became, according to Mark Rosenberg, director of Florida’s Chesed Shel Emes and a chaplain for the Florida Highway Patrol. “They ended up in a bad area full of bushes and thorns,” said Rosenberg. “They walked all through the afternoon, listening for the sounds of cars and motorcycles, but the more they walked the farther they got into the swamp,” said Rosenberg. At some points the swamp was so deep the girls were chin deep in the murky water and they realized that they needed to get to higher ground. They climbed up a small tree which broke and continued their quest to find dry land. As night fell the pair began to get nervous. By daybreak numerous agencies had converged on the scene including members of the Osceola County Sheriff’s Department, the Florida Department of Law Enforcement, Hatzolah of Miami and Florida’s Chesed Shel Emes, with personnel from Governor Rick Scott’s office working all through the night to make all the necessary resources available for the search. The overhead helicopters continued working with the teams on the ground directing them to the girls and dropping the girls kosher food, water and shoes. Rescuers were just 20 yards from the girls when they found themselves in dangerously deep water that was determined to be 25 feet deep, forcing them to find another path to the two teens. After approaching from a different direction, rescuers were able to clear a path all the way to the two 16 year olds who were able to walk out of the woods on their own, two hours after they were initially identified by members of the Osceola County Sheriff’s Department. The girls, who were covered in cuts and scratches from their night in the densely wooded forest, were taken to a staging area to freshen up before they were taken to a second location for a tearful meeting with their parents, who had driven up from Miami to Orlando late last night. “It was probably the most indescribable reunion I have ever seen,” said Rosenberg. The two were taken to Arnold Palmer Hospital in Orlando approximately 30 miles away and were released shortly thereafter. In a phone interview with VIN News, both girls said that will be staying home from school tomorrow, starting their Pesach vacation two days earlier than scheduled. Asked how she felt after her long ordeal, Rivka Moshe said, “I am thanking G-d,” adding that she doesn’t remember much of her ordeal. Bracha Katz’s sentiments were brief but heartfelt when asked if she wanted to address the many people throughout the Jewish community who prayed for safe return. 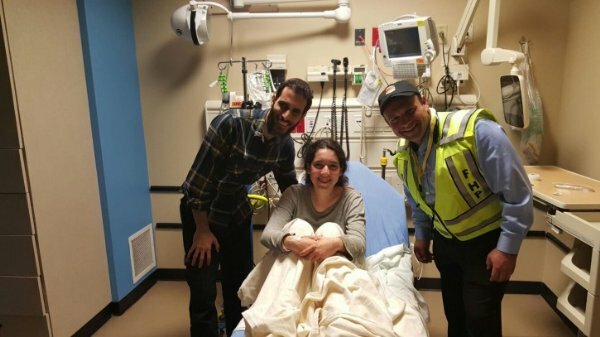 “Thank you,” said Bracha Katz, from her hospital bed. Bracha’s father, Rabbi Yisroel Katz, said that the thought of living without his daughter was incomprehensible throughout the long night. Rosenberg noted that there are lessons to be learned from this frightening episode that thankfully, had a happy ending. “This was a deep swamp and it is a miracle that they got out okay,” said Rosenberg. “But the girls told us that they weren’t worried and they knew they would be okay because of the helicopters they heard at night.